One of the big advantages of septum piercings is that you can hide them completely with a septum piercing retainer. Most piercings can be made more discrete but you can make your septum piercing disappear completely. Septum piercing retainers work so well because the actual piercing is up inside your nose. As long as the jewellery is hidden in your nose, it is completely hidden. 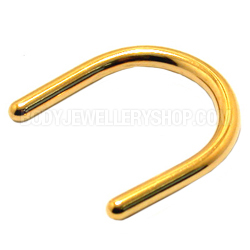 This makes a septum piercing ideal for people who aren’t allowed piercings at work or school. 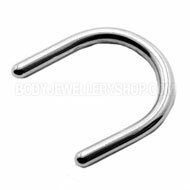 The most popular type of septum retainer is the U-shaped retainer. These retainers are simple but very effective. 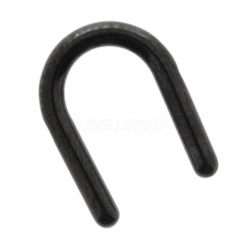 To insert this retainer you pass it through the piercing so that the ends are hanging down from your nostrils. You can then flip up the ends inside your nose, so they are pointing straight up. And voila, your piercing is completely hidden! These septum retainers are very comfortable to wear and won’t fall out. For extra security against prying eyes, choose a black retainer that won’t catch the light. 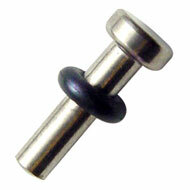 Another option is one of these bullet septum piercing retainers. These retainers are like a tiny flesh plug and are very small. They are held in place by an O-ring and some people find them more comfortable. 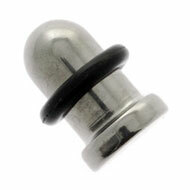 Bullet septum retainers are available in a wide range of gauges, so they are ideal for stretched septum piercings. This entry was posted in Nose Jewellery and tagged piercing retainers, retainer, retainers, Septum Jewellery, Septum Keepers, Septum Piercing, Septum Piercing Retainers, Septum Retainers, U Shape Septum Retainer on June 30, 2012 by Piercing Guru.